Wine Bar George is one of the most highly anticipated additions to the vibrant food and beverage scene at Disney Springs. This 200-seat wine bar, scheduled to open soon, is centrally located at The Landing. The space is reminiscent of a winemaker’s home, complete with terrace seating that has sweeping views of Disney Springs and the waterfront stage. We gladly accepted the invitation from George to stop by his home to taste (and sip!) some of the highlights from Wine Bar George. Executive Chef Ron Rupert, who will be at the helm of all things culinary at Wine Bar George, also joined us. My partner, Alex Dunlap, captured some shots of what will be offered and, no surprise, everything was delicious – on the plate and in the glass! George poured two very special wines to taste – both are listed on the menu under “Outstanding by the Ounce.” These exceptional wines are selected by George in partnership with the respective winery. These wines can be ordered by 1 oz, 3 oz, or 6 oz pours or by the bottle. 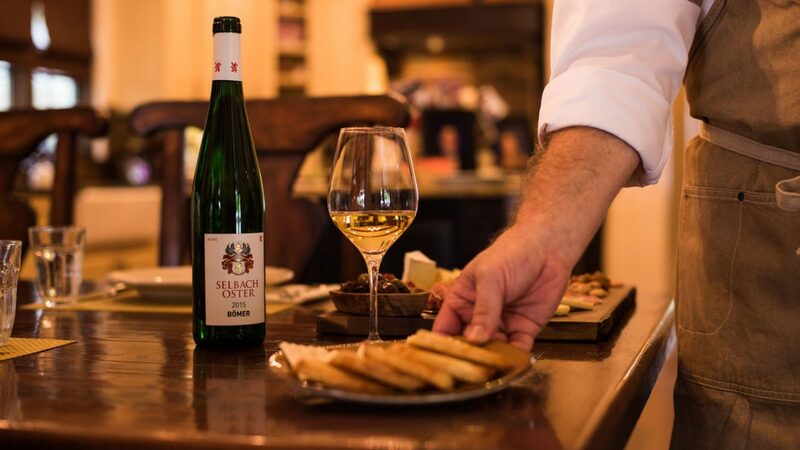 For the first wine, George met with owner/winemaker Johannes Selbach to secure a delicious Selbach-Oster, Bömer Riesling – dry, crisp, lush, and very food-friendly. The second wine – Antinori Guado al Tasso – is an incredible Super Tuscan made from the classic Bordeaux grapes with Cabernet Sauvignon as the star. George snagged the wine direct from the winery in vintages from 2004 through 2013. Ron’s philosophy in the kitchen at Wine Bar George is simple. “I want to create delicious food that pairs well with wine. I pull flavors from around the world that are relevant – that create memories.” Here is a sneak peek at some of his dishes.